Because of the global exposure Teresa Boardman receives, and the fact that she is a regular contributor here, I am regularly asked how she is able to continually keep up the vigorous posting pace on her real estate blog. I can’t speak for her, but I can say that the article she just sent over give us some tips on how to get more than one life out of your blog articles and the pictures that you snap for them. My blog has a lot of words in it. There are almost 1000 posts. Posts that I wrote a couple of years ago are still out there marketing for me. They work hard and people contact me because of them. Last week I got two inquires from posts I wrote in October of 2006. Writing words and taking pictures does take time. I estimate that I have 1500 to 2000 pictures posted on my St. Paul Real Estate blog. I like to get as much use out of my content as I can. There are days where I feel like I don’t have another sentence in me. When someone sends me an email with a questions I often send a response and include a link to a blog post as a more in-depth answer to the question. If I already wrote it do I really need to say it again? When I meet with a new buyer I print a couple of blog posts that apply and include them in a packet that I have for home buyers. When I go on a listing appointment I print the latest market statistics from my blog and add anything else that I think might work. Some of my blog posts are part of my ever changing listing presentation. Yesterday I met with a potential business partner. We were introduced through a third party and have never before met in person. He knew me through my blog, and I printed a couple of articles that I thought would help with our discussions and brought them with me. They served as an ice breaker and to my surprise he had already read both of them. It is the same way with the photos that I take. Many of them are in my Flickr account. I have met some of my neighbors through those photos and have had some new opportunities that I never imagined. Some of the photos have been uploaded onto real estate related web sites and have links back to the posts that they were taken from. I let others in the community use my photos too. I recently took some pictures of a coffee shop. The owners are going to be using them on a web site and give me a photo credit. These same pictures were used in a blog post. The owner of a local coffee shop suggested that I take some of my blog pictures and make them into a photo book and leave them in his shop. I am going to take his advice and see what happens. It might be a good way to market St. Paul, MN and at the same time market my services. A friend suggested hanging some of my photos in the same shop. My name would be on them and it would be another way to keep my name in front of potential clients. I also use my photos for “Moo” cards. They are smaller than a business card, and made from photos in my flickr account. These are the same photos that I use for blog posts. The Moo cards have my name and the domain name of my blog printed on the back. They are simple, but people tend to appreciate them and hang onto them. A small rewrite can and a new picture can give an old article a new life. Reusing a post on the blog works too. A small re-write and a new picture can give an old post a new life. I take the posts that got the most traffic and comments and use them again. No one seems to notice and they have the same, if not more, impact the second time around. I can have a recycled post once a week and I even have a couple posts that I have reused a couple of times. I think it is important to get the most out of my blog content. I spend six to eight hours every week writing and I want that content working for me. I leverage it every way I can. There are many more ways to reuse blog content, be creative with it. 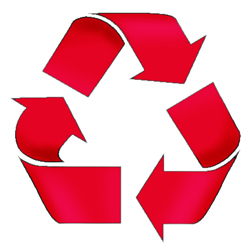 Reuse it as many ways as you can and make it work hard for your business. My site needs some aging time before I can start reusing content. But you have some great ideas in this post. There are so many options for marketing yourself once you start blogging. I love it. Great ideas for reusing blog content. I’ve always felt the same about reusing advertising and PR. Why use a great idea only once? Moo Cards are 2.75 inches long and about an inch wide. Peter, I don’t think gggole has a penalty for using the same content on the same site. Sharon – you have a lot of great content to re-use, probably more than I do. Todd – I keep coming up with more ideas for content re-use. It takes time to generate content we need to get the most out of it. Karl – it doesn’t take long to generate a lot of content. I definitely agree Teresa. People who really are serious about blogging and who dedicate the time to do it right very often forget how much work they have put into their blog….why not squeeze as much juice out of it as possible? I think too many people are getting caught up in SEO for their blogs / sites and forget how important good quality content (info and images) is alone and what else they can do to get their message out to as many people as possible. Your photos example is a perfect solution. I’m a newbie, and I’m hardly qualified to weigh in on the subject since the entirety of my posts is about as long as your average sub sandwich…but I like this idea. Publishing entities do this all the time – they call it “re-purposing” material – and during my 25 years as a freelancer a lot of my articles were re-purposed, re-packaged (into books, special publications, anthologies), and re-sulted in more than a few nice little bonus checks in my mailbox, thank you. Why shouldn’t bloggers re-purpose their work? It can help us avoid some of the heavy lifting of daily posting. And you have the opportunity to freshen up the material a bit, give it a new twist. Eventually I re-purposed myself from a fulltime writer into a Realtor. Suits me just fine. In every transaction, having the patience to constantly repeat your successful practices can be taxing experience. But the result is informing those who have an audience awaiting guidance. Thank you for the insight.